Architecture and history are two things that have always fascinated me. How did the people who lived before us master the craft, science and carpentry needed to build such amazingly wonderful and sometimes frightening structures? Were they hopeful or mindful that the works of their labor would survive centuries after they died? 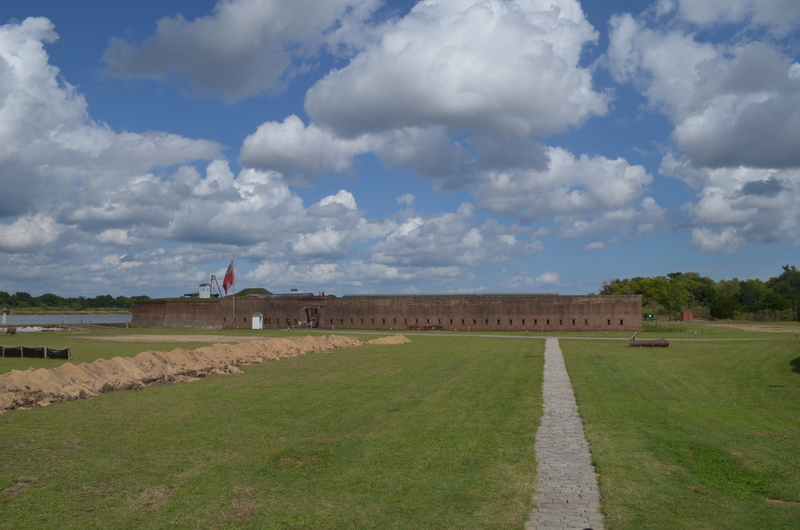 I had the opportunity to visit one such structure recently: Old Fort Jackson in Savannah, GA. Located two miles east of Savannah on the Savannah River, Old Fort Jackson is the oldest standing brick fort in the U.S. The Fort was named after James Jackson, a British native who fought for the American cause during the American Revolutionary War (1775-1783). The construction of the Fort, which took place between 1808 and 1812, was authorized by U.S. President Thomas Jefferson with the goal of it being part of a national defense system of fortifications that would defend his new nation, the United States of America. This defense system would become a very important player in the American Civil War between the Union and Confederate Armies. When you get to the Fort, one of the first things you see is a charming one room structure that looks like a small red barn. This is where you gain entrance to the Fort. 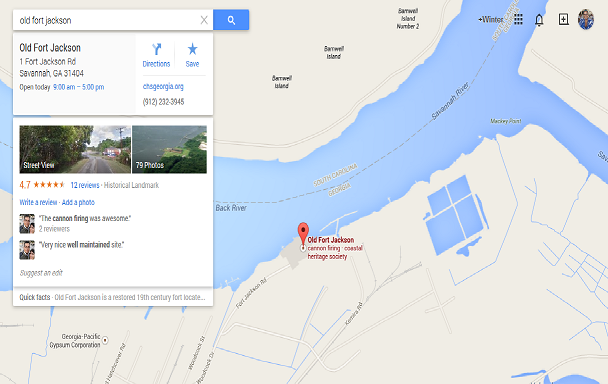 After passing through this building, you can see the Fort a short distance away. As you get closer, the imposing structure rises up from a moat and the details of the Fort’s architecture become clearer. To begin exploring the Fort, you walk across a wooden bridge and through a huge doorway. One this level, you can explore the interior structure of the Fort and get a feeling of how the soldiers stationed at the Fort lived. You can walk through their dormitories, see how they would have be stationed on the wall to protect the Fort, see the remnants of an early bathroom and see how they prepared their meals. On the upper level, you can see how the cannons were placed, how they were fired, and where the powder magazine room (where they stored their fire artillery) was located. As part of the visit, a few visitors had the opportunity to volunteer to help demonstrate how the soldiers would set up their shots before the cannons were fired. The most vulnerable person in this scenario was the person in charge of making sure the cannon was aimed in the right direction and in the right position (lady standing behind the cannon). This person would be the one directing the four men (two on each side) on how to move the cannon into position before the ball and powder were placed in the cannon. Once the cannon was in position, this man would hop down and the switch would be ignited and pulled to fire the cannon. Another great part of this visit was the opportunity to see how the soldiers communicated with their compatriots at other nearby forts. They used a series of flag waving signals to spell out instructions. The tour group participated in decoding a message sent by the costumed soldier. This demonstration taught me that I would not have made a good coder or decoder. My absolute favorite part of the visit to the Fort was the Cannon firing demonstration. The re-enactor, who was absolutely engaging, demonstrated how it took at least 2-3 soldiers to prepare and fire the cannon shown in this demonstration. This ended in a BANG! When leaving the Fort, you walk through the same door that you walked through to enter the Fort. At least, you did if you were lucky. There was so much to see and take in at Old Fort Jackson. Some of my favorite things to see weren’t necessarily the big picture, but the smaller and finer details. A solo drum, a cannon wheel, a series of well-placed doors, or a rusty door hinge; these were just a few of the architectural details that grasped my attention and didn’t let go. I really enjoyed the time I spent at Old Fort Jackson; there is a lot of history to be seen and heard at the Fort. I highly recommend visiting during the cannon firing demonstrations; this is where you really get to learn the most about the Fort. Is there a specific historic place that you’ve visited that you would recommend to a history and architecture buff?